Cresset’s unique solutions are available through easy to use graphical user interfaces, command lines and through workflow solutions such as KNIME™ and Pipeline Pilot™. Using the Pipeline pilot interface enables integration of our approach into standard workflows and with other applications. We provide access to all our applications through Pipeline Pilot components that call the corresponding command line application behind the scenes. Blaze is Cresset’s virutal screening system that is optimized to find novel, diverse hits for your project. Blaze uses Cresset’s unique field technology to generate hits that are similar in electrostatics and shape space but with diverse 2D structures. It runs on a Linux or GPU cluster and is designed to manage compounds, collections, conformations, job distribution and searches. 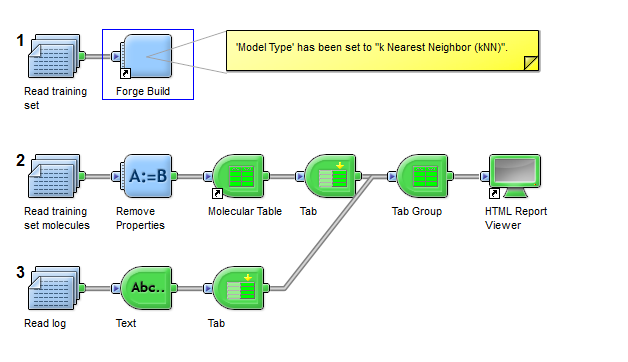 Forge is a powerful ligand-focused workbench for understanding SAR and design. In Pipeline Pilot the Forge components enable ligand comparisons and investigation, scoring of new molecule designs and creation of molecular similarity and disparity matrices. In Pipeline Pilot the Spark components provide access to the scaffold hopping and R-group exploring capabilities with a specialized node to enable graphical specification of the portion of the starter molecule to be replaced. Lastly a database creation node is included. Spark Database Search (on Client) – as above except it enables the graphical selection of the region to be replaced by Spark in a database search experiment. This component calls a locally installed copy of Spark. Spark Database List Viewer – lists all available databases for Spark. Cresset supplies a generic viewer node that calls the main Forge or Torch graphical user interfaces on the client machine. This node is useful for visualizing the electrostatic fields around molecule or for viewing the results of other Cresset components. Installation instructions are detailed here. The Pipeline Pilot components require you to accept the terms of our license agreement when they are installed but do not require further license files. However, the software used by the Pipeline Pilot components does require a valid license file. Contact us for more information. Cresset provides example workflows that encompass each of the Cresset Pipeline Pilot components. The examples are included in the installation package and can be found under Protocols > Examples > Chemistry > Cresset. Additional examples for Blaze that require configuration before they will execute (which prevents inclusion in the installation package) are available for download here.